hand-made are words rarely seen in connection with anything these days, principally due to the mechanised nature of our modern world. should you ever have had the good fortune to visit the hallowed isle you may have succumbed to at least one of the distillery tours on offer. pretty much everyone does: you don't come here for the weather. assuming you were paying enough attention as the process is explained in great detail, surrounded by the rather bewildering array of wood, copper and steel that comprises the internals of any of the islay malt distilleries, you might just notice some of the differences. bruichladdich makes great play of their 'no computers' stance, employing the bulk of the original equipment present in the buildings from the heyday of manual labour. shift your attentions to either of the diageo owned plants at lagavulin or caol ila (or, perchance, port ellen maltings) and computers are very much to the fore. admittedly some of the control panels, particlularly in the colossal mash room at caol ila, look like something out of an episode of thunderbirds or joe ninety, but computing power nonetheless. it's unlikely that silicon processing has much impact on the amber nectar (if that's what floats your boat) that you subsequently get a taste of at the end of your tour, but the entire industry would love you to think that islay malts are lovingly handcrafted and cared for in those oak casks, stored in white stone warehouses only mere inches from the salt sea and spray. the reality is that much of it is tankered off the island on a calmac ferry, and stored in warehouses just outside glasgow or edinburgh. that, with the exception of the aforementioned distillery at bruichladdich, is a fact of malt life; let's face it, the majority is bottled on the mainland, so it's a logical step to move it there for maturation. aside from which, there's more warehouse space. the notion of handcrafting is one from the marketing departments of the big conglomerates and individually owned distilleries alike. the days when the island's distilleries employed large numbers of manual labourers are pretty much past, in keeping with many a comparable industry. it was suggested a few years back that the local supermarket and the hospital employed more folk than all the distilleries combined. with bruichladdich operating their own bottling plant on islay, that may no longer be precisely the case, but the difference is likely minimal. however, we all like to hold onto the notion that there's a large degree of human intervention; that products are the result of artisanship, or even artistry, therefore imbuing them with humanity, as opposed to something like the motor car, manufacturers of which seem perfectly happy to show armies of robots spot welding chassis ad finitum in huge automated and modern plants. there is a definite dividing line here: those children of the modern age seem almost nostalgically in love with production methods of a bygone age, where many of those born in that bygone age perhaps see this for what it is and embrace the modern alternative. by way of example i offer the mighty dave t who spent many a club ride aboard a lugged steel frame, but now rides a carbon monocoque focus and claims it to be the best he's ever owned or ridden. but handcrafted undoubtedly has its place in the age of binary digits, because otherwise many a skill will disappear for ever, and you just never know when they might be needed in the future, particularly in the light of the energy and global warming doomsayers. but take that out of the equation, and there is an inherent pride in owning or using something that is the result of human toil and sweat. superficially, there is little to differentiate riding a colnago clx 2.0 and the all-steel cielo that is the velocipede du jour at present, but just knowing that the chris king machine was welded by persons of my acquaintance in an establishment in a city i have visited, ingrains it with an aura of an altogether different hue. and the same can be vociferously stated for the track mitts that graced my two bunches of fives on today's extended pedalling. initial inspection would find it hard to separate dromarti's la grande mitt cognac from a pair of lookalikes i owned many years ago from the house of caratti (a long time demised, since you ask), but put them on before heading out for a ride, and the massive difference is all too apparent. the label at the cuff states that they have been hand made in england, and martin at dromarti told me he searched far and wide to find a source for the hand crocheted backs. 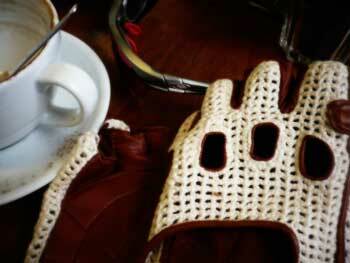 the mighty dave t was mightily impressed, and tried to nip off after coffee with the mitts in his pocket. crocheted mitts bear a truly retro appearance, but the reality is that the machine produced versions usually presented, have a marked tendency to unravel at oft times an early stage in their career. the difference in the hand-crocheting is palpable. that takes care of the cosmetic arrangement; what of the business end? the remainder of the mitts are fashioned from impossibly soft leather, with intelligently crafted minimal padding on the palm and around the thumb. there are those importantly classic cutouts on the back for the knuckles, edged with the same cognac leather, and there is a suitable open back allowing for the secret cyclist tan patch. closure is effected by a dromarti embossed velcro strap; at this point i would wish to defer: while velcro is likely more versatile, a popper fastening would have been more in keeping with the overall style. never let substance get in the way of style is an oft repeated mantra, one with which i have a certain sympathy, but the reality is that i'd like gloves to be comfortable, practical, hard-wearing and more than equal to the task of keeping hands on bars and easing the task of gear changing. these tick all the right boxes, but lift themselves above the melee by simply being hand-crafted. 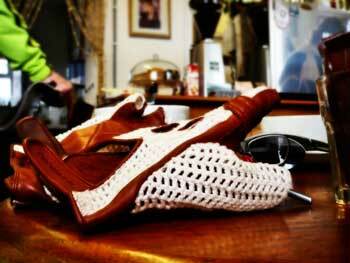 there's a certain sumptuousness in riding a handmade bicycle (with white bar tape, don't forget) faced at each kilometre by british made leather and crocheted mitts. it might not impress anyone else in debbie's on a saturday afternoon, but i care not one whit; my hands love me for it. 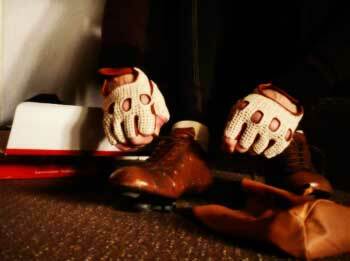 la grande mitts cognac retail at £99 ($138) and arrive cossetted inside their own embossed leather bag. size availability is medium (tested), large and xl.